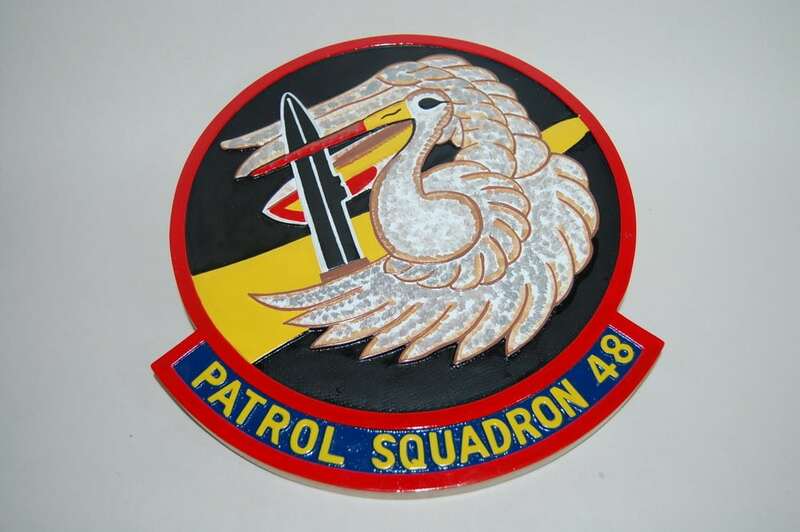 Proudly display your VP-48 Boomer colors with this 14 inch plaque – a great way to show your lineage! FIVE (VP-905) in May 1946. FIFTY ONE (VP-HL-51) on 15 November 1946. THIRTY ONE (VP-731) in February 1950. 48) on 4 February 1953. 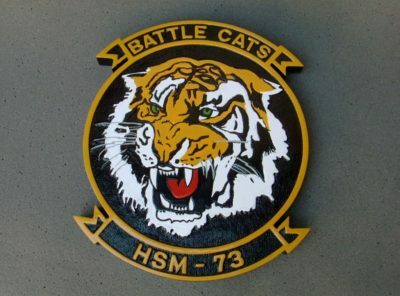 Disestablished on 23 May 1991.
the enemy’s presence. 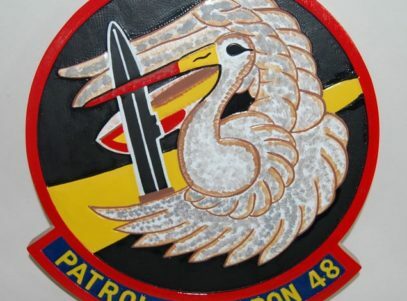 Colors: cloud, white; shield border, red; background, medium blue; waves, dark blue; bomb, blue with red stripes; owl, black legs and wing tips; tail and neck, red-brown; owl’s body and feet, yellow; radio waves, red. 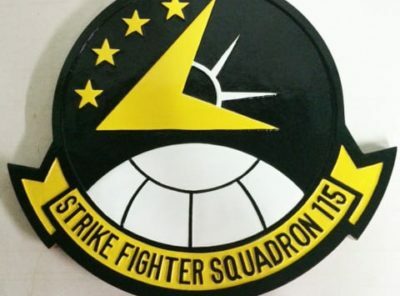 When the squadron was augmented into the regular Navy and redesignated VP-48 in 1953, the commanding officer requested that the insignia of the former VP- 48, disestablished in 1949, be authorized for use by the current squadron. 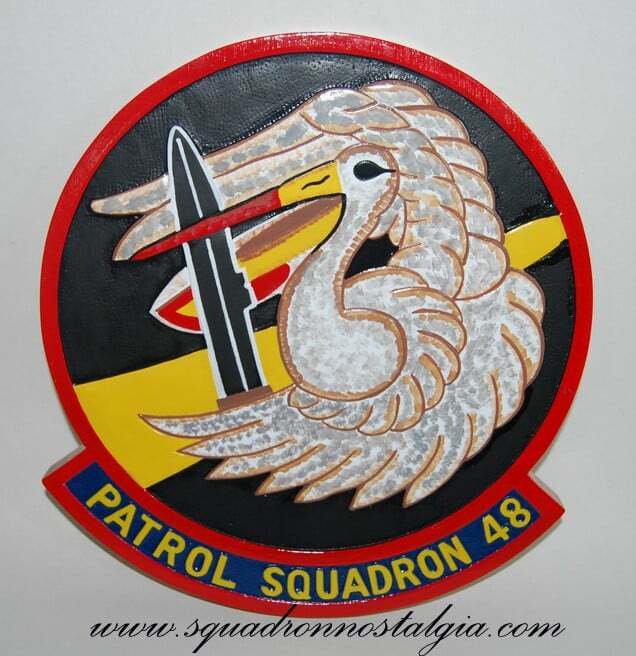 Assuming that CNO’s previous approval of the first VP-48 insignia on 14 March 1949 was still valid, the squadron put the design into use. 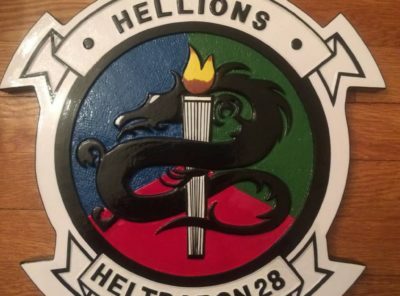 It consisted of a circular insignia with an Amazon riding the back of a dragon, holding a shield overhead. In the dragon’s claws were a depth bomb and a cluster of lightning bolts. 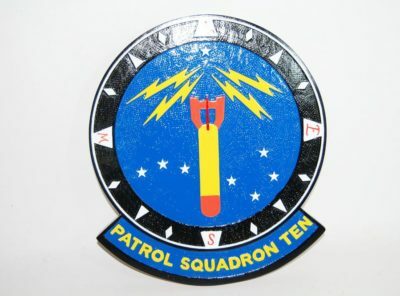 The obvious symbolism was the antishipping and ASW mission of the squadron represented by the bomb, the long-range surveillance of the PBM by the radio wave lightning bolts, and the ability to strike from above as represented by the dragon’s wings. 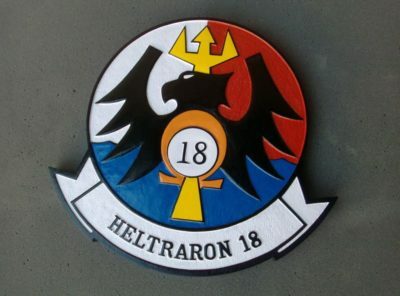 Colors: dragon, red, blue and green; wings, redorange, red, blue and green; bomb, gray; bolts of lightning, yellow; female warrior, deep yellow with blond hair; shield, yellow, white and red; armor, white. On 7 May 1953 CNO indicated the Amazon was no longer appropriate and that a design proposed by the U.S. Army Heraldic Branch should be substituted instead. 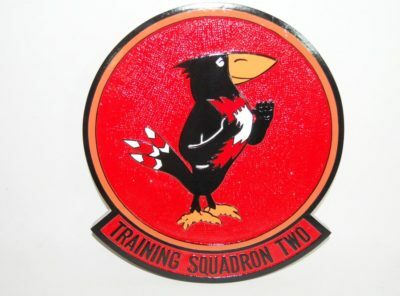 The squadron, which had been using the earlier VP-48 insignia, continued to do so while it submitted a counter proposal to the design from the Army. 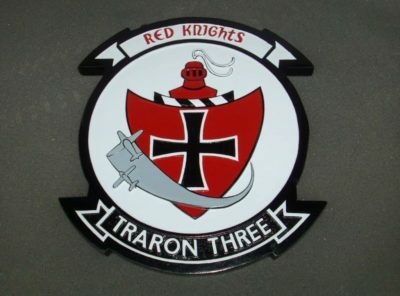 design remained in use until the squadron was disestablished in 1991.